The Christophe-Montigny Mitrailleuse was developed in Belgium around 1863 and refined over the next few years. in its final version, it was a 37-barrelled gun capable of firing nearly 300 rounds a minute. 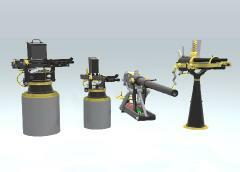 This web page includes an animation showing how the gun worked, and describes the operation. 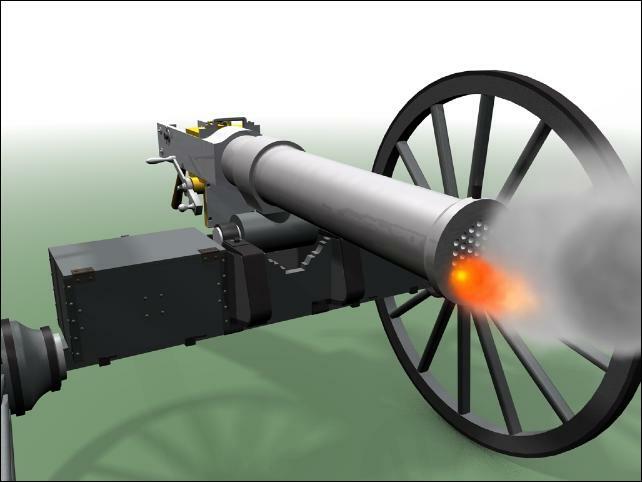 There are excellent articles on the history and use of the Mitrailleuse available on the web, in particular Dr. Patrick Marder's article on the use of the French Reffye mitrailleuse in the Franco-Prussian war of 1870-72. The early model of the Christophe-Montigny Mitrailleuse consisted of a cast iron cylindrical tube containing 31 hexagonal steel barrels that were brazed together in 7 vertical columns. Wille [m5] states that these barrels had a bore of 14mm with 5 groove rifling having a pitch of 1 turn in 820mm. A trunnion ring was mounted about three-quarters of the length of the cast-iron tube from the front. The early Montigny mitrailleuse used a screw press to drive the lock mechanism backwards and forwards, in a similar manner to the Reffey mitrailleuse. The Second model, which introduced a few years before Willie [m5] published his book in 1871, had 37 instead of 31 barrels, and a different mechanism for loading. The illustrations in Willie’s book [m5] show not only the Montigny mitrailleuse, but also the Reffey gun of 1867 and the 1865 model of the Gatling gun. The drawings are valuable as they are of draftsman quality, showing plan, elevation and cross sections of components, all to the same scale for each model of gun. It is noticeable some of the same drawings appear in other publications of the period, for example [m8]. Of particular interest is that these drawings show the first model Montigny mitrailleuse, with 31 barrels, but they have been touched up to show the positions for the additional 6 barrels that were fitted to the 2nd model of Montigny mitrailleuse. 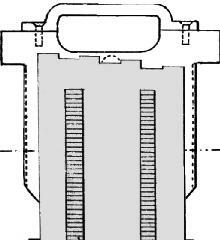 The cross section drawing could not be patched, so it shows the five centreline barrels of the early model, while the cartridge carrier and rear elevation have dotted rings showing where the additional barrels would be placed. This animation is modelled from the Willie drawings, but with 37 barrels. In the second model, the pressure screw is replaced by a loading lever, which was much faster to operate. 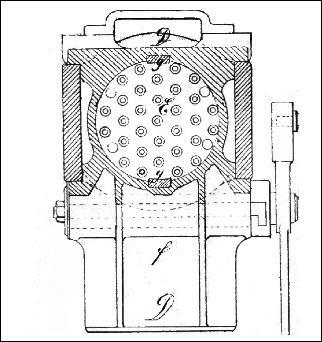 When the books were published (1871), a salvo was fired by turning a firing crank on the right-hand side of the lock mechanism through one complete revolution, however, by 1874, Owen [m7] states that the firing crank had been replaced by a lever. The replacement of the pressure screw by a loading lever to close the lock mechanism produced a significant increase in the firing rate. 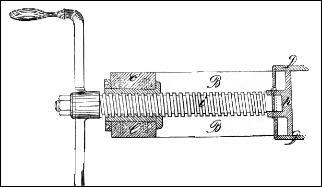 With the pressure screw, it was only possible to fire about 5 or 6 salvoes a minute, but with the lever, a mitrailleur could fire 7 - 8 salvoes a minute. Given the increase in the number of barrels, the second model had a peak firing rate of 296 rounds a minute, compared to the 186 of the first model. 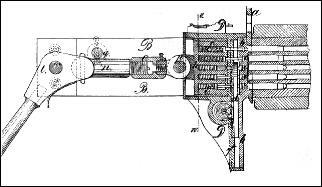 The second model had a slightly improved cartridge plate, but this still suffered from the problem that the narrowness of the plate did not provide sufficient support to the bullets, and with the weight of the bullet a distance from the point of support, the cartridges could sag, so that uniform entry of all cartridges into the barrels became difficult and often caused substantial delays and disruption. Willie [m5] notes that to achieve a high rate of sustained fire, it would be necessary to have a large number of pre-loaded cartridge plates. However, he suggests that the plates needed to be custom made for each mitrailleur to ensure the correct cartridge alignment, and would not be interchangeable with other guns. Providing a large number of plates for each gun would increase the unit costs. However trials were being conducted to manufacture cartridge plates with sufficient tolerances to allow interchangeability. The cartridge case was made initially from thick cardboard but later rolled from thin brass sheet. In both designs, they were fitted with a brass base cap, which held the percussion cap. [m5] states that both designs were also covered for their entire length by a covering of cotton cloth. There is also some uncertainty over the calibre of the guns. Willie states that both the early and late models had a bore of 14mm [I may, of course have mis-translated the German text], while Huon, Jean. Military rifle and machine gun cartridges (Arms & Armor Press, 1988) gives a primary calibre of 11.45mm (known as the 11mm Montigny cartridge), with variants from 11 up to 13mm. In ‘The Mitrailleuse’ by Dr. Patrick Marder [m1], the calibre is given as 11 mm. The Montigny mitrailleuse was tested in trials by Austria in 1869, and by England in 1870. These trials compared the operation and effectiveness of various guns, including rifles, smooth bore and rifled cannon firing shrapnel or case shot, and Gatling guns. The Austrians selected the Montigny mitrailleuse in preference, while the English made the opposite choice in 1870 and adopted the Gatling gun. Note the French Reffey mitrailleuse was still a secret when the trials were conducted. Willie, in 1871, however still considers the Montigny mitrailleuse superior to the Reffey in that it had 37 barrels compared to the Reffey’s 25, and used the lever arm rather than the pressure screw, and could achieve a higher firing rate, or fire for longer between reloads. 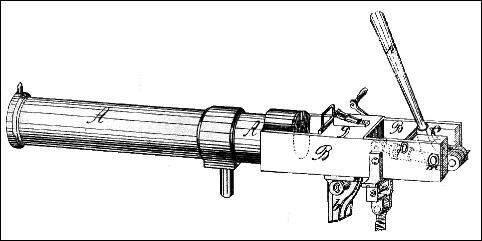 The basic mechanism of the Montigny mitrailleuse consists of a spring loaded piston, with a flat tip and a short firing pin for each barrel. In the cocked position, the piston is held back by a trigger plate interposed between the piston and the firing pin. As the plate is lowered, the piston is released and flies across the top of the trigger plate to strike the firing pin, which in turn is forced forwards into the percussion cap of the cartridge. In the starting position, the loading lever is raised, and the lock mechanism withdrawn. The lock case, which is shorter than the cavity in the lock casing, is fully to the rear of the housing cavity. The spring loaded pistons, which are fully extended, have been pulled clear and to the rear of the trigger plate. The trigger plate is raised to its highest position. A loaded cartridge carrier is then slid into the slots on the steel breech plate. As the carrier descends, the chamfer on the foot of the carrier pushes the firing pins back into their cavities in the breech plate. 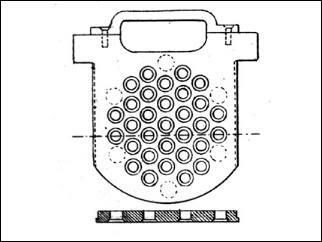 The firing pins themselves do not have springs and are free to move within the holes drilled in the breech plate, but are held in place by a perforated plate at the rear of the breech plate. As the lever is moved down, the first movement pushes the lock case forward within the lock housing. Since all the pistons are now blocked by the raised trigger plate they are forced backwards so compressing their firing springs. 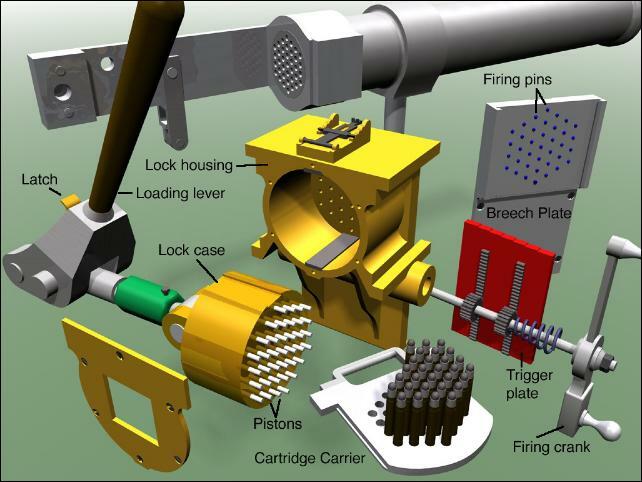 When the lock case is fully forward within the lock housing, the whole lock mechanism and the cartridge carrier are pushed forwards and the cartridges are forced into the barrels. When the lever is fully down, the steel breech plate will be forcing the cartridge carrier hard up against the rear of the barrel. A catch on the jaws of the loading lever locks the lever in the down position, since if the pivots and linkages do not remain perfectly in line during the firing, the recoil will force the loading lever to turn and the lock mechanism will fly backwards at great speed. The gunner now turns the firing crank. This is a handle that is connected to pinion gear wheels that engage with racks attached to the trigger plate. The gear wheels are sized so that for one complete turn of the firing crank, the trigger plate moves from its highest to its lowest position. As the crank is turned, it compresses a coil spring so that during the unloading sequence, the crank and the firing plate will be returned to their starting positions automatically. This is described more fully below. 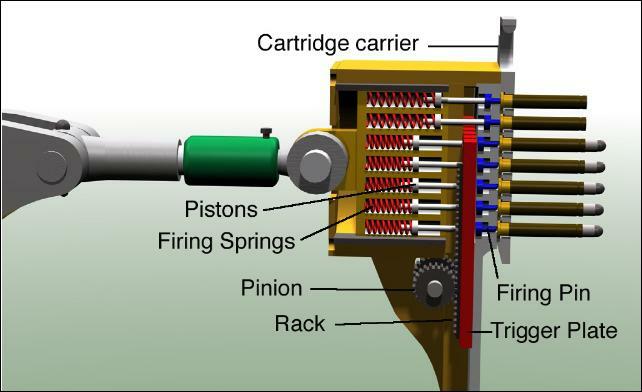 As the trigger plate is lowered, the spring loaded pistons are released in turn and fly forwards to strike the collar on their corresponding firing pin, which is then driven forwards to ignite the percussion cap and the cartridge is discharged. The top edge of the firing plate is cut into seven steps so that barrels are discharged one at a time. This reduces the recoil forces on the gun, and allows the gunner to sweep a stream of bullets across the target area if required. The drawing of the firing plate (Rastplatte) in Willie’s book [m5] would produce a ragged discharge sequence, and on several occasions two barrels would be fired together. This is shown in the adjacent rollover, where it can be seen that two cartridges (shown in red) would be discharged together. Since the profile from [m5] does not seem to be optimal, I have used a different profile for the top edge that does release the pistons in a steady sequence, assuming the firing crank is turned at a steady rate. The rate of fire depends on how fast the gunner turns the firing crank. One full turn will fire all 37 cartridges. Firing all within one or two seconds would give a very high rate of fire, but not allow much time to scatter the bullets. As an illustration, the first salvo in the animation is 11 seconds, while later ones last for 6 seconds. The gun has a pintle trunnions mount, so it is highly likely that it also had a mechanism for scattering the discharge. This would be fitted to the support on the left side of the gun above the elevation screws. However, I have no drawing showing how this might have worked, and a scattering device is not shown in the animation. On completion of the salvo, the gun is unloaded. The loading lever is unlocked and raised and as it does so, the first movement will be to pull the lock case backwards within the lock housing. This pulls the pistons clear of the trigger plate. The firing crank and trigger plate are driven by the tensioned coil spring back to their cocked positions without operator intervention. 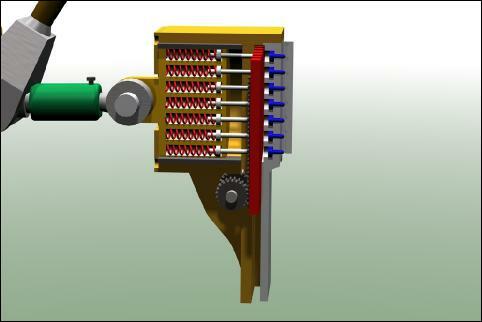 The final sequence of the animation, however, shows the withdrawal of the lock mechanism and resetting/recocking the trigger plate as separate actions for emphasis.